Neil Armstrong's First Words: One Small Fib or Giant Leap by Brother? 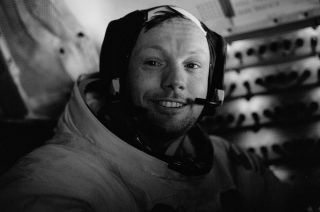 Neil Armstrong, the commander of Apollo 11 and the first man to walk on the moon, will be memorialized on Aug. 31, 2012. Were Neil Armstrong's historic first words spoken on the moon pre-scripted or, as the late astronaut long held, ad-libbed on the spot? Since returning to Earth four decades ago and up until his death last year, Armstrong maintained that he did not give any thought to what he would say while on the moon until after he safely landed the Apollo 11 lunar module "Eagle" at Tranquility Base. "He slipped me a piece of paper and said 'read that,'" said Dean Armstrong, Neil's younger brother, during a new BBC documentary on the first moonwalker's life that first aired on Sunday (Dec. 30). "On that piece of paper there was 'That's one small step for [a] man, one giant leap for mankind.'" Neil then asked his brother what he thought about the quote. "Fabulous," Dean recalled as saying, to which his brother replied, 'I thought you might like that, but I wanted you to read it.'" According to Dean, that conversation took place months before his brother launched to the moon. But not everyone accepts his account as being accurate. "As much as I respect Dean Armstrong, I do not believe his recollection of this is correct," James R. Hansen, Neil Armstrong's authorized biographer, wrote on Facebook. "I spent a great deal of time talking about this issue during my near-60 hours of interviews for my biography of him, 'First Man,'" Hansen said, describing his research into the origin of the "one small step" quote. "Neil was the sort of man who never told lies. He might avoid or evade certain questions and answers, but he never outright lied." In "First Man: A Life of Neil A. Armstrong" (2005, Simon and Schuster), Armstrong told Hansen that he came up with the quote as he completed the post-landing checklist and prepared for humanity's first moonwalk. "Once on the surface and realizing that the moment was at hand, fortunately I had some hours to think about it after getting there," Armstrong said. Armstrong recounted the same course of events in other interviews and during public lectures held before and after the research for his biography. To Hansen, the astronaut's own words leave no room for debate. "He told me quite specifically and emphatically that he did not pre-plan what he would say and came up with the phrase only after the landing," Hansen wrote on Facebook. "That was what he told me clearly and on tape." As further evidence, "First Man" also quotes Armstrong's first wife Janet as having had "absolutely no idea what her husband would say when he stepped onto the moon." Nor, apparently, did his crewmates. "On the way to the moon, Mike [Collins] and I had asked Neil what he was going to say when he stepped out on the moon," astronaut Buzz Aldrin told Hansen. "He had replied that he was still thinking it over." Hansen interviewed Dean Armstrong for "First Man" as well, but Neil's brother did not say anything then about his knowing the quote ahead of time. "I think we should accept [what Neil said] as true and not a story his brother never has told for 43 years and did not mention to me during my long interview for the book," said Hansen. "Why wouldn't he have told that story for his brother's authorized biography?" Dean Armstrong is not the first to suggest his brother gave more than a passing thought to his first words on the moon. As Hansen recounts in "First Man," some have attributed the idea for the quote to the moonwalker's apparent affinity for J.R.R. Tolkien's works of fiction. After leaving NASA in 1971, Armstrong named his farm for a valley described in "The Lord of the Rings" and chose an email address with a Tolkien theme. According to the theory, Armstrong's historic quote can be traced to "The Hobbit," to a scene where the protagonist Bilbo Baggins jumps over the villainous Gollum in a leap that Tolkien described as "not a great leap for a man, but a leap in the dark." "Regrettably for Tolkien fans," explained Hansen in "First Man," "Armstrong's reading of the classic books could not have influenced what he said when he stepped on the lunar surface in 1969. Indeed, he did come to read 'The Hobbit' and 'The Lord of the Rings,' but not until well after Apollo 11." Another hypothesis suggests Armstrong took inspiration from a memo circulating around NASA. Written by Willis Shapely, an associate deputy administrator at the space agency's headquarters in Washington, D.C., the memo suggested that the lunar landing should be symbolized "as an historic step forward for all mankind." The problem, Hansen writes, is Armstrong had no memory of ever seeing the memo, let alone it "planting the seed" for his historic first words.